James J. Gruccio, Jr. graduated from Villanova University with a Bachelor of Arts degree in Political Science in 1987. He continued his studies at Villanova University School of Law where he received his Juris Doctor in 1990. He served as a judicial clerk for the Honorable Robert E. Francis, Presiding Chancery Judge of Vicinage 15. 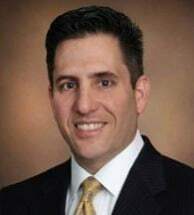 Mr. Gruccio is Counsel to the Firm and serves as Chief Financial Officer and In-House Counsel for the Burns Kull Automotive Group. Mr. Gruccio’s experience includes supervising and oversight of multi-franchise dealer operations with focus on financial compliance, securing credit facilities, procuring business insurances, land use and construction needs as well as corporate governance, assignment of and participation in business litigation, employment matters and negotiation of labor contracts.